Past institute attendees agree: NICWA’s training institutes are cost-effective professional development opportunities that help you remain current in your knowledge of the ever-changing field of child welfare. Join us for our upcoming training institutes. These interactive and energetic courses are taught by dynamic trainers who are experts in the field of Indian child welfare. Trainings are led by professionals with an extensive experience working with tribal communities. Participants will also enjoy the opportunity to network with other attendees from tribal, state, and national agencies located throughout the country. Contact Sarah Wittmann for registration information. Register OnlineDownload our paper registration form here. 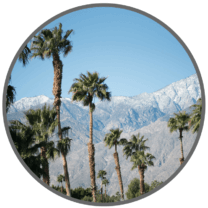 The training will be held at the DoubleTree by Hilton Hotel Golf Resort Palm Springs 67967 Vista Chino Cathedral City, California 92234 Online hotel reservations Reservations by phone: (760) 322-7000 Special event rate: $133 plus tax. When making reservations, individuals must refer to the group “NI2” room block to receive the discounted rate. Rates are guaranteed until January 14, 2019, or until sold out. After that date, the hotel will charge at the prevailing rate (if space allows). Rate includes wireless high-speed internet, self-parking, in-room coffee, fitness center, and pool access. Register Online Download our paper registration form here. Group code: NICWA 2019 Protecting our Children Single rooms are $135/night plus tax. Special event rate: $179 plus tax. 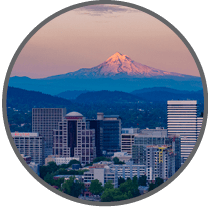 When making reservations, individuals must refer to the group “NICWA Training Meeting- Portland 2019” room block to receive the discounted rate. Rates are guaranteed until May 27, 2019, or until sold out. After that date, the hotel will charge at the prevailing rate (if space allows). Rate includes $5 daily self-parking, fitness center, and pool access. 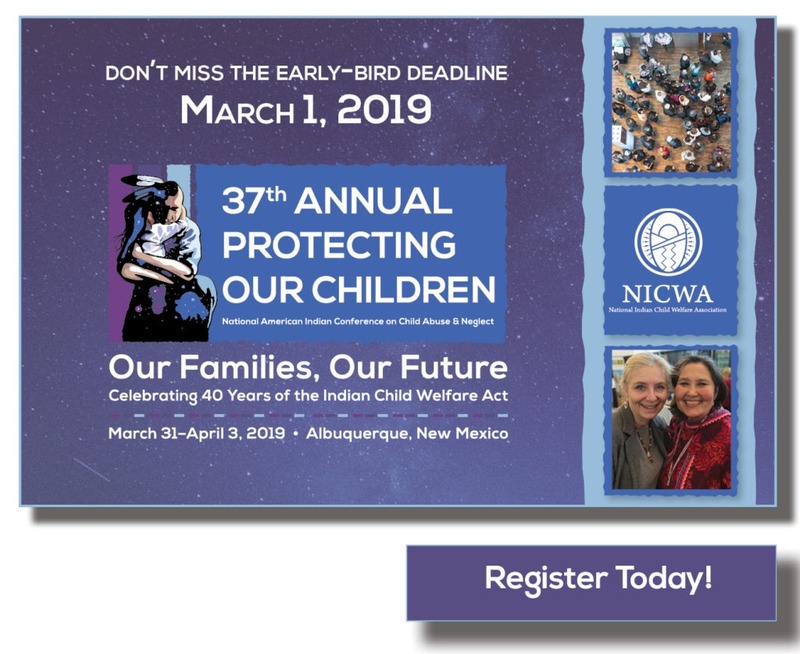 This three-day training provides participants with information about the basic legal requirements of the Indian Child Welfare Act of 1978 (ICWA) and the practice issues involved with ICWA’s implementation. A brief history of U.S. Indian policy as it relates to Indian children and families sets the stage for an examination of the specific provisions of ICWA and practice tips for both tribal and state social workers. Participants will also learn how to successfully integrate other federal and state policies with ICWA—such as the Adoption and Safe Families Act—and support developing tribal and state agreements and other systems changes. This training includes information about the recent Bureau of Indian Affairs ICWA regulations and guidelines. Our most popular training, Positive Indian Parenting (PIP) prepares tribal and non-tribal child welfare personnel to train American Indian and Alaska Native parents using a culturally specific approach. The materials presented during this two- or three-day training draw on the strengths of historic Indian child-rearing practices and blend traditional values with contemporary skills. Storytelling, cradleboards, harmony, lessons of nature, behavior management, and the use of praise are discussed. This three-day training about tribal in-home services from a system of care strengths-based perspective is a set of family-centered services designed to keep families together. 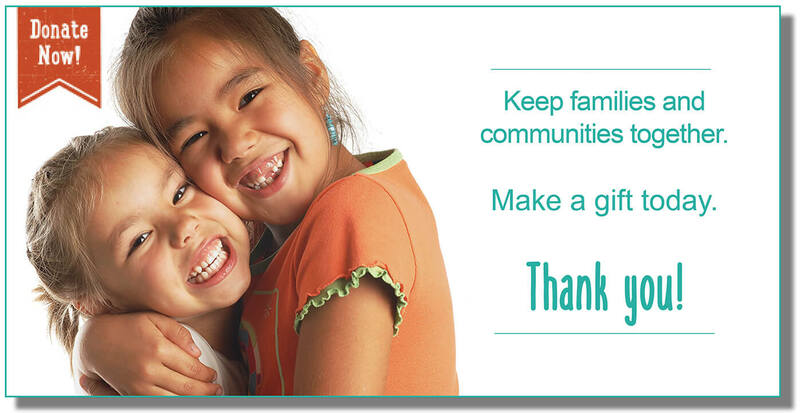 These services help families to improve their functionality and strengthen family values for vulnerable populations. Some topics include family preservation, family services, family support, prevention, and helping families access services. 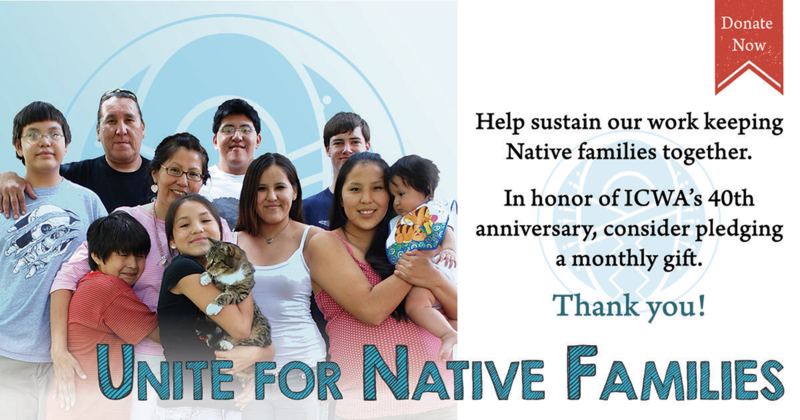 Family preservation services are based on the principle that the greatest priority for the protection of Native children is to strengthen Native families. This two-day training covers judicial processes for the recognition and certification of customary law regarding the adoption of children. It sets out a culturally-based framework for conducting formal adoptions without the termination of parental rights. The Tribal Customary Adoption training is based on tribal customs and values that can be used by tribes to accomplish culturally-appropriate permanency for children in tribal child welfare programs. Working effectively with Native youth and families in American Indian/Alaska Native child welfare requires knowledge and information on the diverse cultural nuances and history of tribal communities. Each tribe is diverse in nature, but there are common parallels shared among tribal cultures. 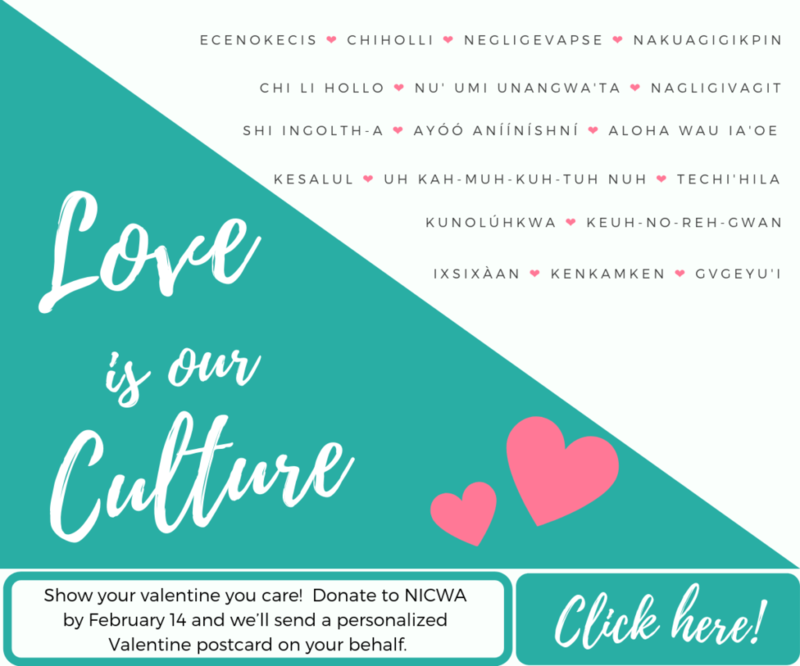 Utilizing NICWA’s Relational Worldview Model as a framework, this training will provide guidance on how to build cross-cultural skills and implement culturally responsive services to connect with tribal communities you serve. Parental substance use disorders are a factor in many child welfare cases. This training will provide an overview of working with substance-abusing Native families from both a direct service and a systems collaboration point of view. The trainer will discuss how to deal with this issue and how systems collaboration can make successful outcomes possible. A collaborative model that engages child welfare, the courts, and behavioral health providers will be discussed. Participants will learn five essential roles for working with substance-abusing families and how their work can be accomplished through partnering on the parent’s recovery. 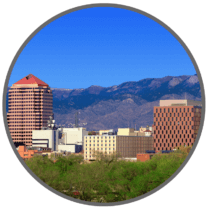 This three-day training prepares participants with information about the basic legal requirements of ICWA and will train participants on how to provide qualified expert witness testimony in ICWA cases as well as the practice issues involved. Our workshops are participant-centered. We expect to learn as much from participants as they learn from us. We view our presentations as discussions that are designed to provide clarity and understanding of topics discussed: i.e. what is culture? who has it? what difference does it make? We will also work toward common understanding of vocabulary that is often used but might mean different things to each of us, e.g. prejudice, discrimination, oppression, affirmative action, and others. Please note for all trainings that if registration does not meet the minimum number, the training may be cancelled and registration will be refunded. Registration fees cover workshop sessions, all materials, one group lunch, and CEUs accredited by the National Association of Social Workers. Participants are responsible for the additional cost of all other meals, lodging, and travel.